My obsession with personality tests usually becomes a conversation starter for me. I ask everyone I meet and speak more than three words with what their personality type is. What can I say, personality types can be spot on! Once you take the initial Myers-Briggs Type Indicator test you will discover so much more about yourself. I've taken the test over and over again and my personality type falls under the category of INFJ. INFJ, or better known as the advocate, is a rare personality type. Go figure! I think less than 5% of the population consists of people with the INFJ personality type. INFJs love to be helpful. This personality type aligns with me because I am always seeking to be a helpful friend or colleague in my life. I also love to seek balance. I also do not use logic and fact, but rather emotion and sensitive language to communicate with other people. I crave deep and intimate relationships. As an INFJ, I do not need hundreds of friends in my life to feel satisfied. I rely on close relationships that are meaningful and maintaining my small circle of friends is important to me. I am also a very loyal friend to those around me because of this! Have You Taken the Myers-Briggs Type Indicator Test, yet? Do you know how many events I've dragged my sister to this past year? Plenty! She is such a trooper when I invite her out to network with me. Of course, the free food helps, too. As someone in the insurance industry, she frequently needs to attend her own networking meetings to connect with new clients. She also works on her public speaking abilities a few times a month where she stands in front of a room full of professionals and gives out presentations on insurance. I am grateful for her in many ways because she is someone that I can bring along with me to events to feel more at ease. It's not uncommon to believe introverts despise talking to others. This is not true for all of us introverts out there! Don't think we hate talking because I actually love talking to new faces at parties. 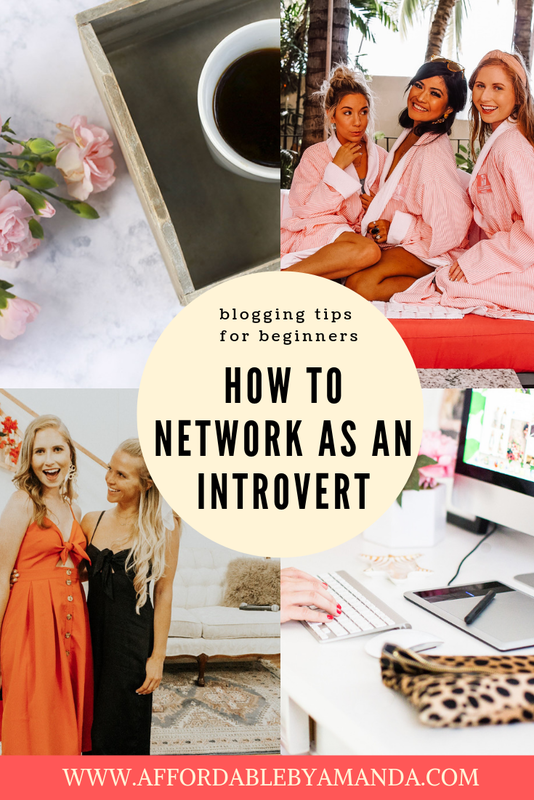 In fact, I am an introvert but I love talking to other people at the Tampa blogger events I attend throughout the year. It might be hard to believe, but some introverts can handle small talk and getting to know other people in small doses like I do. When I attend networking events, I usually make sure the rest of the day is spent alone. I need to have my alone time in order to gear up for the few hours I plan on talking for. It's essential for me to prepare myself ahead of time with enough time by myself to feed into my extroverted side. Hello, this is Amanda, your new therapist speaking. *Note: I am not a real therapist...keep reading! Something I've learned from my own therapy sessions this year is how to turn negative thoughts into positive thoughts. Most of my anxiety in my head includes an abundance of negative thoughts. I will convince myself that nobody wants to talk to me at a party or let myself believe I don't fit in at an event based on LITTLE to absolutely NO evidence! You need to come up with facts. Facts are essential for introverts. You must take notice of how you plan on entering the event with a clear mind before your brain tries to clog it up with NONSENSE that doesn't even pan out. The truth (and fact) is that any preconceived ideas about you are not valid. You need to think positively about the event. 6. You know how to talk to people at restaurants and stores. Channel that same energy when you approach someone at the event. 7. We are all humans. We all strive to feel accepted. Don't let yourself feel any different than any other person at the event! Another technique that I was taught while in a therapy session is to look around and find anything that looks familiar to me. For example, when I enter a new room, I check my surroundings for familiar things. I usually check the room for friends of mine that I have made from blogging. However, if I see absolutely no one that looks familiar to me, I start to break down the place I'm standing in. I will look for familiar activities. I see people sitting on their phones. I see people laughing. I see people waiting for their cars. I see people ordering food when I go to restaurants. These are all normal activities that even I know I engage in on a regular basis. When I see other people doing things that I've done (even if it's just checking their phone!) I instantly feel myself calm down. This might sound crazy, but I am 100% a person who talks to herself out loud. I believe there is scientific evidence that proves how talking to yourself is a healthy habit to have. Yes, I talk to myself. This is something I will probably do for the rest of my life! Even when I was going through really bad anxiety, I would talk to myself and repeat certain phrases to encourage myself to maintain my composure in high-stress situations. Giving myself pep talks before I head out to an important business event has helped me tremendously. Even when I arrive at the event, I will continue to talk and whisper positive messages to myself to reduce signs of anxiety. I tell myself what an awesome time I will have at the event. I tell myself to look forward to catching up with blog friends at the event, and how great it will be to meet some new faces, too. Speaking out loud forces us to slow down our thoughts racing through our minds. The next time you feel nervous or anxious, take some extra minutes to process how you are feeling by talking it out loud. Of course, you should also be kind to yourself. Self-talk needs to be positive so you can create a positive outcome. Be your own cheerleader! Use the power of self-talk to get through stressful situations, too. As a fashion blogger, dressing up is part of my job. When it comes to events, I also try to look my best. Dressing up in my favorite new jeans and sweater can instantly boost my mood. Shopping for new clothes brings me a lot of joy and when I have an excuse to wear something new I feel stylish and confident. Dressing for the occasion will also give you the self-confidence you need to tackle the scary idea of attending an event. Pick out a brand new outfit to wear for the impending event because it will make you feel better when you look amazing! In addition to dressing the part, start smiling. Did you know that smiling can trick your brain into happiness? The brain loves when you grin. As soon as you enter the event, start smiling! Smiling can also reduce your stress level and lower your heart rate. Do YOU have any tips for networking as an introvert or as an extrovert? Leave your advice below in the comments!